This will be our first year to homeschool and have both parents working from home. For the first several years we homeschooled, I worked from home teaching piano lessons from 3-6PM, Monday through Friday, and my husband worked from 9-5. With that type of work schedule, I was available during the day to help homeschool my kids, so our daily schedule was probably pretty typical for homeschool families. I was able to work with all the kids for several hours without many interruptions. This was especially good since my children were in elementary and junior high during that time and needed more help with their work. For the last few years, however, I've done graphic and web design from home instead of teaching piano. This change in occupation meant my work hours were sprinkled throughout the day. 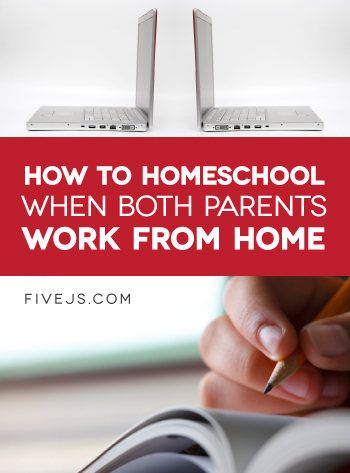 As such, I'd often find myself in the middle of a project when a child or two needed my help, and I'd struggle with trying to balance the time for both homeschooling and working. To say that I felt disorganized, guilty, and out of control most of the time would be an understatement. Finding that balance between homeschooling and working felt impossible. That was one reason we opted to enroll my kids in several online classes through The Potter's School for the last two years; I didn't feel organized enough to handle both teaching and working from home. And then we move on to this school year. With my husband retiring from full-time ministry in June and coming home to work with me doing design, we now have to juggle both our work schedules with homeschooling a 6th grader, 9th grader and 11th grader. With the not-so-great experience of the last several years under my belt, I was substantially apprehensive about how we could make it work. But thankfully, through much prayer, preparation, and experimentation, things have gone extremely smoothly so far. 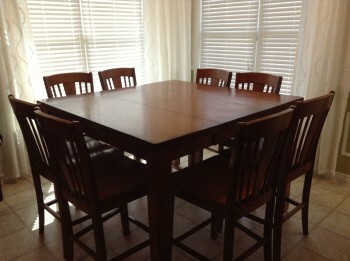 We've put several routines in place that have helped us manage our time, both with our business and with our children. 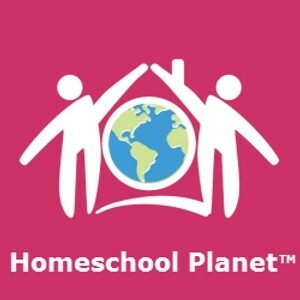 I'm sure our homeschool looks different from your homeschool, but perhaps some of the things we've implemented to help balance working from home and homeschooling might help you in your home as well. We started implementing a morning meeting in July, right after my husband came home to work. We've learned from experience that when left to their own devices, our children could sleep the day away—and so could we—so we needed some way of making sure everyone starts the day early enough to be able to get everything done. We also wanted to help our kids develop time management skills, to spend time each morning planning out what they want to accomplish that day. So for our Morning Meeting, everyone brings a planner, and after we spend some time in Bible Study (we're using the Begin book by Answers in Genesis right now), we discuss the plans for the day. We talk about whether or not there's a formal dinner that evening—and by formal I mean whether or not my husband is making dinner or if dinner is YOYO instead (meaning "You're On Your Own"). We also look at our family calendar to see if there are any meetings, appointments, or other activities that we need to plan for that day. Everyone makes sure to record the activities in his planner. 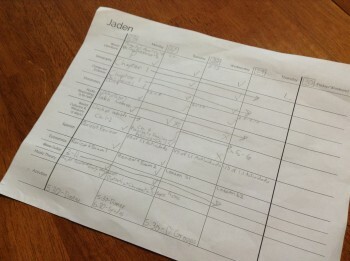 For planning their schoolwork for the day, the kids bring their weekly assignment sheets on which they've written out their assignments for each subject. (And yes, I'm having them fill in their own weekly assignment sheets this year. I'll have more on that next week!). The kids have the responsibility to decide when they do each of their assignments each week, as long as they get them all done. They look over the activities for the day and determine what school work they're going to do that day and when they're going to do it. One of the main problems I've had in previous years is finding uninterrupted time to get work done so that I can have more uninterrupted time to work with the kids. To solve that problem, my husband and I decided to set aside a few hours each morning during which we can get work done. We've dubbed that time "DND" or "Do Not Disturb". Thanks to DND, not only are Jeff and I able to get work done, but our kids aren't interrupting each other either. Without the usual distractions, they can complete a lot of their schoolwork in those three hours. By noon, all of us have felt like we've gotten a lot accomplished! DND has been incredibly effective and has really helped us feel like we have much more control of our schedule. We no longer end up at 9pm wondering why we didn't get any work done that day! Lunch is always YO-YO, so we don't have a scheduled time for that. But after lunch, I focus on working with the kids, which right now is mostly Joely for her Spanish and math and Jerah on occasion for algebra or biology experiments. Since I've already worked three straight hours that morning, I feel like I can set that work aside and focus 100% on my kids and their schoolwork. My husband usually works through the afternoon if he has projects, or he works on continuing education to improve his skills. Ideally we would also do our chores during this unscheduled afternoon time (we've come up with a daily chores chart for each of us, but we've not perfected its implementation quite yet! ), but in reality, they usually don't get done until later. If we have doctor appointments or errands to run, I also try to schedule it during this time. If we're having a formal dinner time, it's usually at 5:30. If we're YO-YOing, then there's no telling when everyone eats. If we have evening activities planned, during the Morning Meeting I would have made sure to schedule Work Review for the afternoon instead of after dinner. But if the evening is free, I take the time after dinner to sit down with each child and walk through their work for the day. In previous years, I've felt like I don't have time to do this on a daily basis, which has been a recipe for disaster! So far, this daily work review has been wonderful and I plan to continue it permanently. So what exactly is Work Review? Basically I take their assignment sheets, go through each subject, and discuss with each child what he's studied that day (probably similar to the Charlotte Mason-type narration). If they've taken notes, I have them summarize their notes for me. If there is work that needs graded, we grade it then. The Work Review time has been a great opportunity not only to make sure the kids are doing the work they're supposed to be doing, but to discuss concepts the kids are struggling with. When I've done only a weekly review in the past, instead of a daily review, I've found my kids are much more prone to 'skipping' assignments (again, I'm sure this never happens in your house! ), so this daily review keeps everyone honest. I'm confident that the daily reviews will be a huge factor in making this school year successful. During this evening time, we'll often have church activities, watch our favorite TV programs (over the internet usually), play Spades, or finish up work projects. We've not done this as we want the last couple weeks since my parents are living with us and our daily routines have been thrown off. But ideally at 9:30pm, my cell phone alarm goes off and we all stop what we're doing and spend time doing our daily chores and straightening up the house. My parents will be moving in to the house next door to us this week, so our 9:30 Clean Up will be re-implemented starting next week for sure! We usually send the kids to their rooms around 10:30pm, and we'll either stay up and get more work done or just chill out in the living room. We used to stay up till 1am most nights, but since we've implemented this stricter schedule, we've tried turning in earlier each night. Our Friday schedule is still unknown since we haven't have a "school year" Friday yet. But right now the plan is for Friday to be a makeup day for any schoolwork that didn't get done earlier that week (we're doing a 4-day school week this year). We'll still have Morning Meeetings, DND, and Clean Up, but other than that, the schedule is much more fluid and unstructured. Fridays are also the days my father will work with Jaden doing experiments for the electronics course he is taking this year. I've discovered that I have a tendency to work too much, so Saturdays we try not to schedule any work so that we can focus on house projects or other family activities. On Sundays, both Jeff and I try not to work at all—or even check email. We attend church and do activities as a family. We've definitely discovered that having a definite plan for each day, which we determine each morning at our Morning Meeting, allows us to keep our tendency toward disorganization under control. Yet our routine isn't so rigid that we can't alter it when other things come up. But it does provide us with a framework in which we can be as productive as possible—both with schoolwork and our jobs—while keeping our family priorities in line. If you'd like to implement some of the features of our routine in your own home, but you have younger children that can't yet work independently, you might alter DND time so that only one parent has DND at a time while the other is working with the children, and then later in the day, you can swap. Morning Meetings can even be adapted for families with young children. Even toddlers can learn to understand time management and the concept of routine by discussing the plans for the day. This is awesome. I love the daily schedule and the fact that you have time set aside to work with each of them. We're still figuring out how this year's going to go. With Emma being younger, we can't do true DND time. However, we're planning more independent work so that everyone's work gets done AND we have time together. Thanks for the encouragement. I like the idea of a set time every day for work review. You're right, that is a recipe for disaster if you don't do it daily. My husband and I are starting our own business this year, the idea of DND is a really good one. My kids are older (8th, 10th and 12th grades), so I think this will really work out well for us. Thanks for sharing!